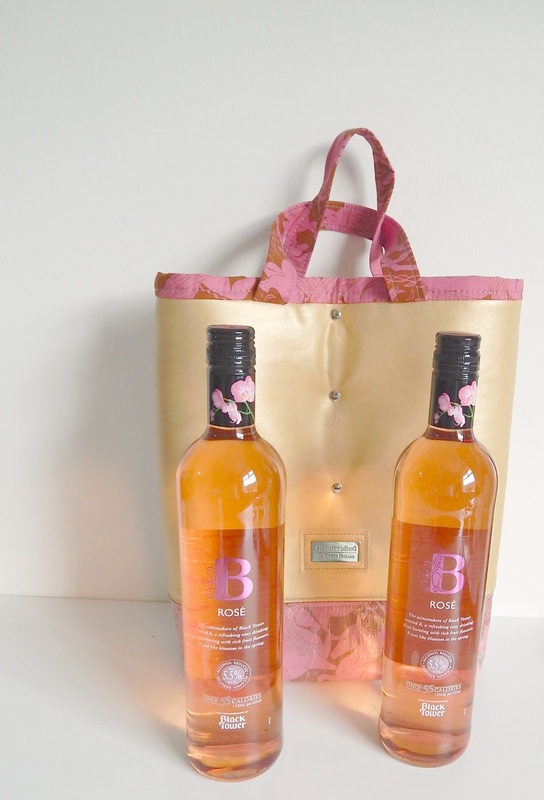 Now, I'm not saying I have a readership of ladies who love a bit of wine, but if such a person were to exist, and they wanted to take a couple of bottles with them somewhere in a more stylish bag than a cardboard carrier, then that person would find a great alteration below...hypothetically speaking. Ok, I'm lost, on with the super simple tutorial. In fact, it's so simple I'm sure you'd be able to work this out yourselves! 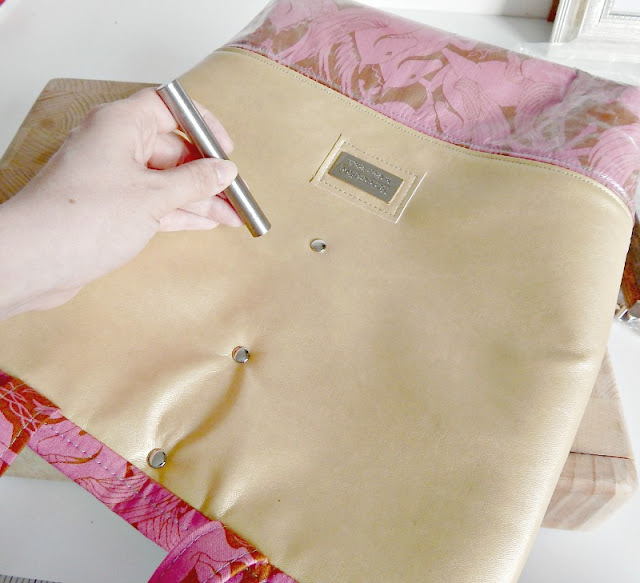 You'll need 3 x double cap rivets, I used 8mm ones from Emmaline Bags. 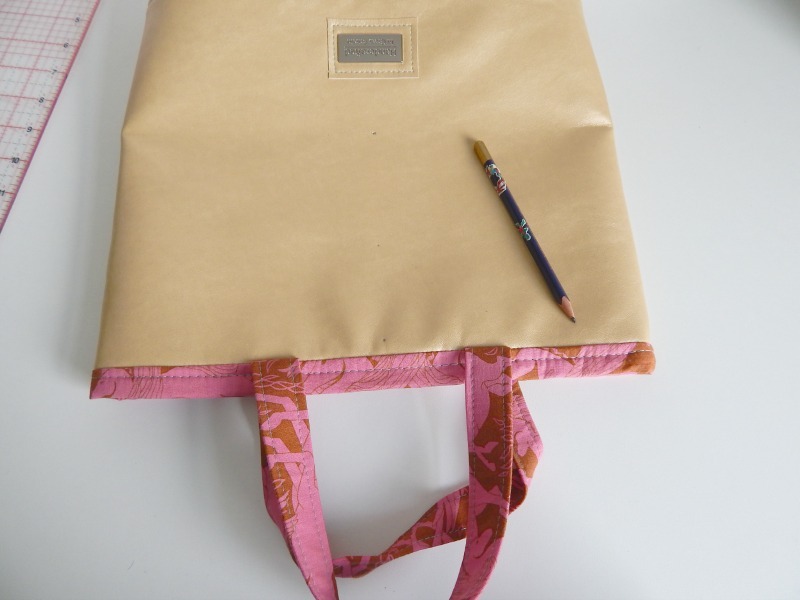 To start with you'll want to make the free summer tote tutorial from August. 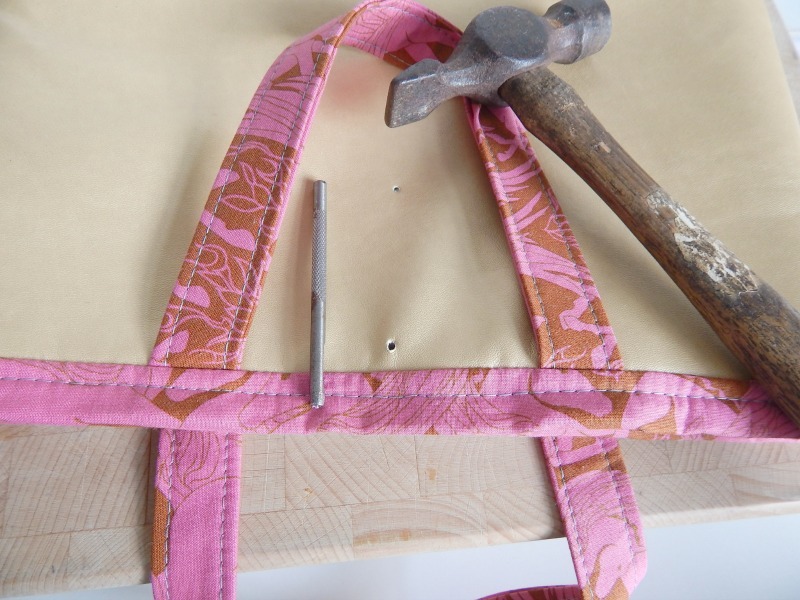 Then flatten the bag out making sure the side seams are even on each side. 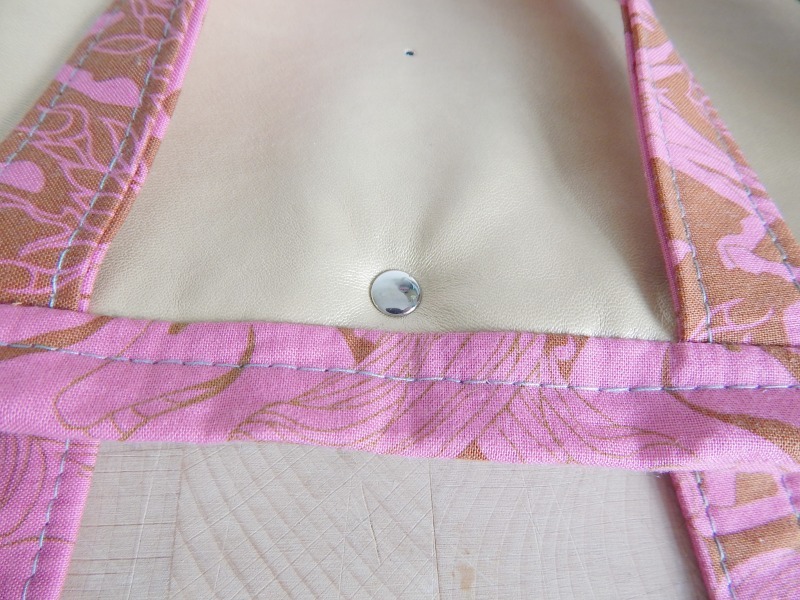 I pushed my hand into the bag and smoothed down the lining to make sure it was all lovely and flat. Then mark a small dot in the centre of the bag (6.5" from each edge) at 1", 3.5" and 6.5" from the top of the bag. You can see these marks lightly on my photo below. Then making sure the bag is still lovely and flat and even, punch a small hole through all of the layers of the bag. Yup, all of it, both outers, both linings and all of the lovely stabilisers and interfacings that are inside. Make sure your handles are out of the way! 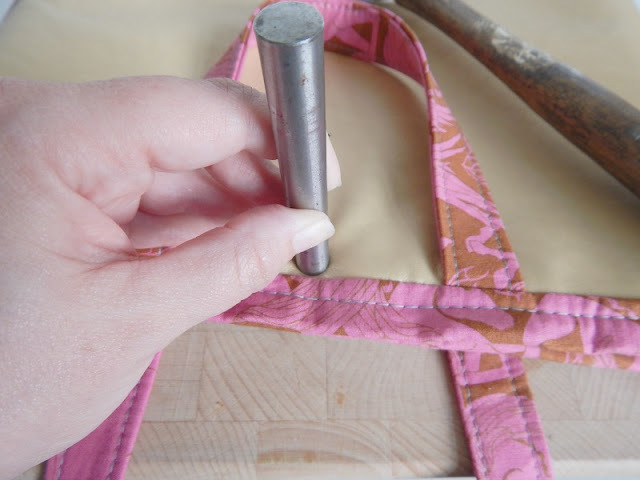 Pop a double cap rivet through from the wrong side, through both sides of the bag, and then pop the cap on. With your anvil underneath the bottom of the rivet, pop the setter on top and give it a good couple of confident whacks with a hammer to set the rivet. 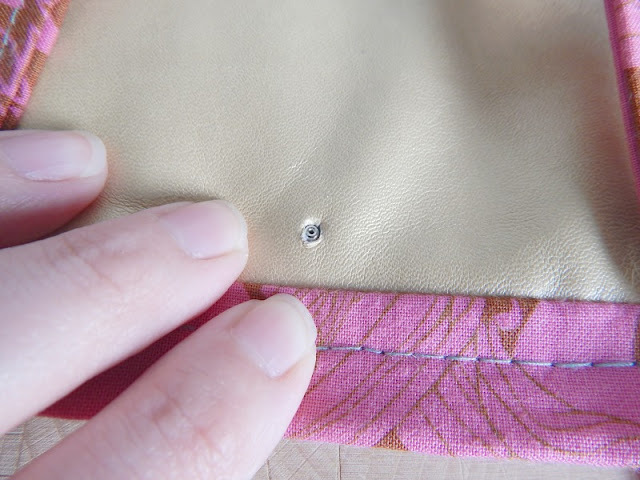 Repeat for the other two holes so that you have all three double cap rivets through both sides of your tote. You will see from my top two rivets (the bottom one hasn't been set yet) that it will pull the bag slightly from the layers, that's ok. This will leave a cavity at the bottom of the bag in case you want to sneak any sweeties into wherever you're sneaking your wine in as well. It'll keep the bottles separated and safe from knocking into each other. 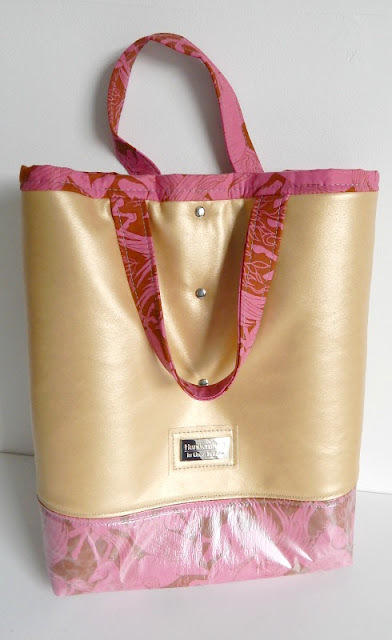 The tote is tall enough that it's not obvious from the outside that you're carrying wine bottles and of course because they're separated there's no clanking. 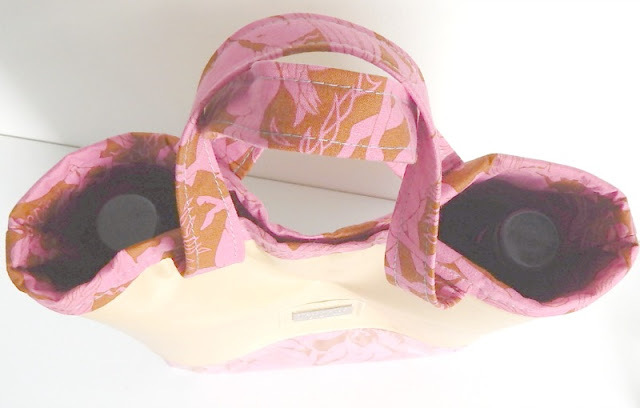 I am working on the assumption here that you're going to make this to smuggle wine into somewhere that you shouldn't be bringing your own of course.... but it's also good for occasions when you're meant to bring a bottle (or two)! Super simple and quick, but ever so useful, right?